The true hero of Warcraft is the amazing special effect work done by Industrial Light and Magic with the motion capture and the landscape of the realm of Azeroth. Since the 90s, gamers all around the world have fallen in love with the World of Warcraft. Its fan base has reached such fevered levels that there are conventions for the series and people have even been married in the game itself. For years, Warcraft's legion of loyal (some may say fanatical) fans have been clamoring for a theatrical vision of their world, so, surely, when this film was released it made many gamers quite happy and head to the theaters to see their video game universe come to life. The film follows the story of orc shaman Gul'dan who is trying to escape form his dying world. He manages to make his way into the human realm of Azeroth, by way of black magic. Anduin Lothar (Travis Fimmel, Vikings) and Medivh (Ben Foster, Hell or High Water), along with others, fight to keep the human realm safe from the orc army, named the Horde. While this plot sounds overly simple, it is actually somewhat hard to comprehend at the same time, and the film reflects that confusion. It isn't until about the 25 minute mark that the scenes displayed in front of you seem to form part of a story. Even then, if you decided to duck out of the room for a second you will be lost again in this ever changing tale. However, the the mass swelling of Warcraft players around the world, the plot of the film is ripped directly out of their favorite gaming situations so they will understand more than the average viewer. portrayal of someone fighting the good/evil that lays inside them. These two, along with Paula Patton (Mission Impossible: Ghost Protocol), Dominic Cooper (Preacher), and Toby Kebbell (Dawn of the Planet of the Apes), help to elevate Warcraft into a film that demonstrates the passion and care the studios behind it wanted to give to its fans instead of just dialing it in to get a quick buck by releasing a dull all CGI-FEST or hiring D-rated actors. The true hero of Warcraft is the amazing special effect work done by Industrial Light and Magic with the motion capture and the landscape of the realm of Azeroth. Even in 4K UHD, where special effects tend to start looking a bit more fake to the naked eye, Warcraft's were spot on. Everything blended seamlessly and perfectly on film. Warcraft's 4K UHD transfer is presented in 2160p, and while the resolution is on the low side for this fledgling format, the picture looked simply amazing on the screen. Colors are muted more than in the original theatrical release, which is a puzzling choice; however, it does appear to work well on this release. The Dolby Atmos soundtrack is pretty robust. Dialog is crisp and clear and relegated to the center channel at most times while many of the battle special effects are concentrated in the rear along with the great soundtrack by Ramin Djawadi (Game of Thrones). As with all current 4K UHD releases, the special features are found on the adjoining Blu-ray in the release. 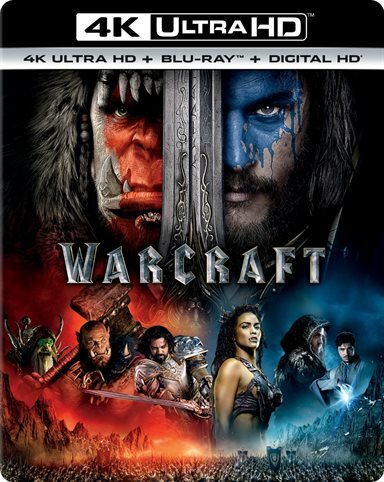 They include the now normal Digital HD copy of Warcraft, Deleted/Extended Scenes, Gag Reel , The World of Warcraft on Film (a in depth look into the filming of the movie), The Fandom of Warcraft (a look into "Blizzard Con" and the fans of the Warcraft series), Warcraft: Bonds of Brotherhood Motion Comic, Warcraft: The Madame Tussauds Experience (a look into the wax figures created in London for Warcraft Madame Tussauds exhibit), ILM: Behind the Magic of Warcraft (Before and after effects shots), and the Comic Con 2013 Warcraft Teaser. The Warcraft film accomplishes what it set out to do. It creates something that fans of the series have been clamoring for, for over two decades, and does it in such a way that it is everything and more to them. It has epic battles, dialog and language taken directly from the games, in-game references and the characters that have become part of their lives. It should also be mentioned that Warcraft had the biggest opening in Chinese box-office history because of these fans. If you despise most fantasy films except Peter Jackson's Middle Earth sagas, then stay far far away from Warcraft. If you are a avid action/science fiction fan, or a casual gamer, pick this one up for a lazy Sunday afternoon. However, if you live, sleep, eat The World of Warcraft and have not seen this movie yet, do yourself a favor and purchase it immediately from your favorite vendor. This might just become your favorite film of 2016. Download Warcraft from the iTunes Store in Digial HD. For more information about Warcraft visit the FlickDirect Movie Database.